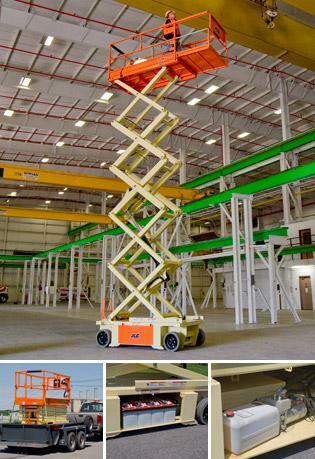 32 Foot Electric Scissor Lift Rental – JLG 3248RS , is available for rent in Rochester NY, Ithaca NY and the entire Western New York region from the Duke Company. The JLG 3248S electric scissor lift is featured by a passive pothole protection, ability to traverse grades of up to 25%, and innovative operator controls. Its compact size enables travel through doorways.